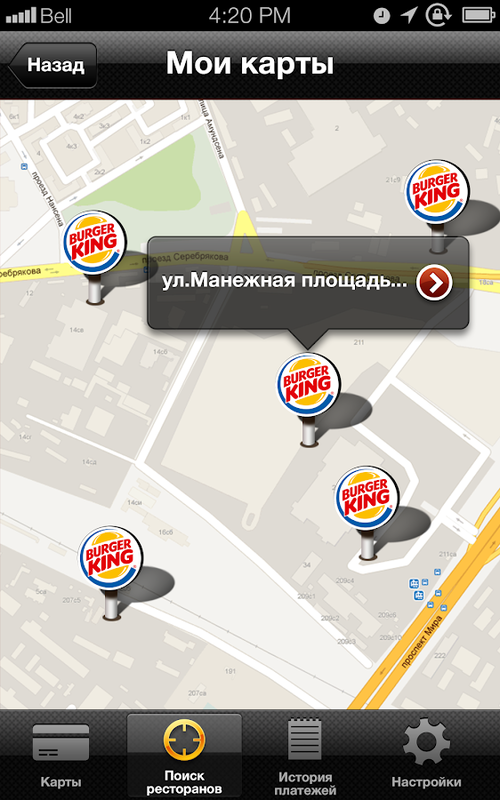 Официальное российское приложение Burger KingCard Mobile Russia для Android. Теперь вы можете использовать свое Android устройство чтобыоплачивать покупки в Burger King через заранее пополненную вресторане (пока только так) Карту. Это самый быстрый способ оплаты в Burger King – просто сканируйтештрих-код! С помощью этого приложения Вы можете оплатить покупки во всехроссийских ресторанах Burger King со счета своей карты Burger Kingс помощью Вашего Android устройства. Вы можете проверить баланс Вашей карты Burger King и посмотретьисторию транзакций. Скачайте приложение, введите в него номер и ПИН-код своей картыBurger King, зарегистрируйте свою карту и приложение сгенерируетштрих-код, который нужно отсканировать для оплаты на кассе. 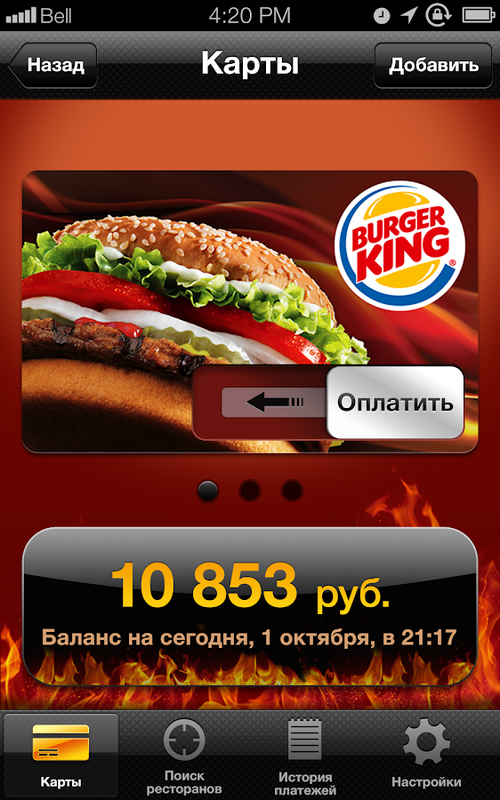 Russian official appBurger King Card Mobile Russia for Android. 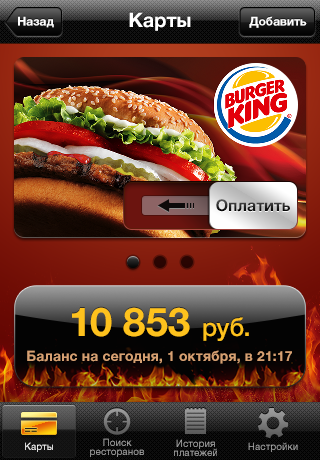 Now you can use your Android device to make purchases at BurgerKing through augmented in advance at the restaurant (so far only)Card. This is the fastest way to pay Burger King - just scan the barcode! 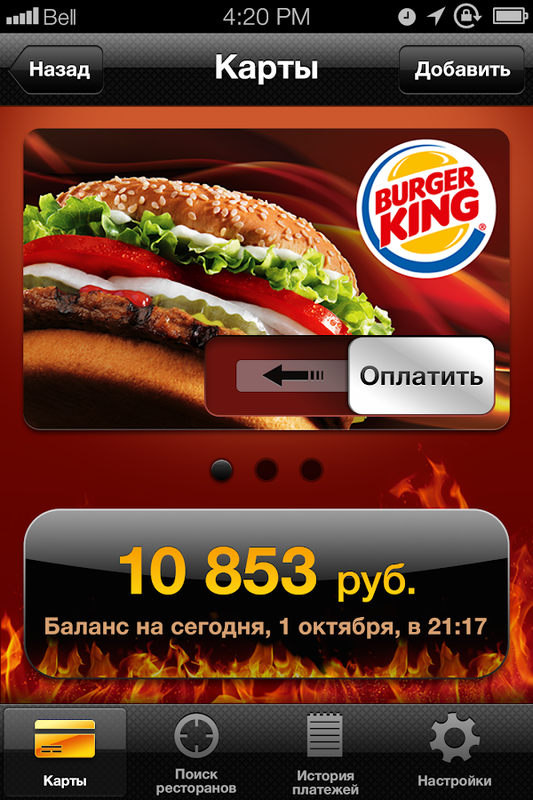 With this application, you can pay for purchases in all Russianrestaurant Burger King from the account of the card Burger Kingwith the help of your Android device. You can check the balance of your card Burger King and see thetransaction history. Download the app, enter his number and PIN of the card Burger King,register your card and the app will generate a bar code to bescanned at the cash register to pay. 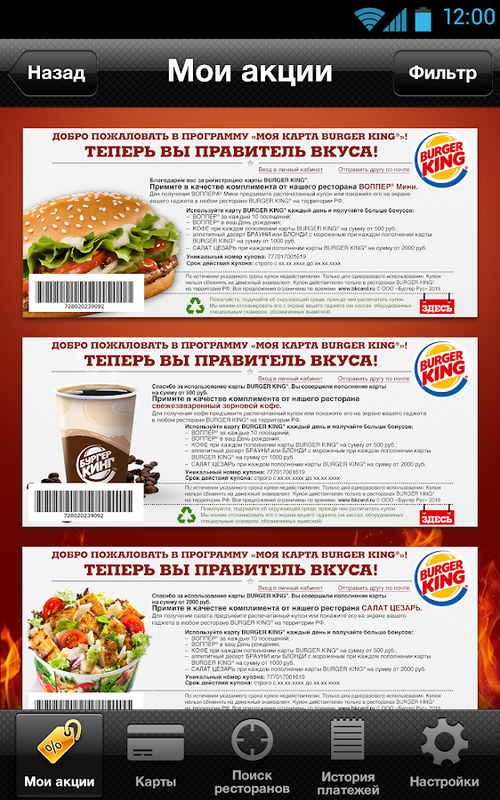 Официальное российское приложение Burger KingCard Mobile Russia для Android.Теперь вы можете использовать свое Android устройство чтобыоплачивать покупки в Burger King через заранее пополненную вресторане (пока только так) Карту.Это самый быстрый способ оплаты в Burger King – просто сканируйтештрих-код!С помощью этого приложения Вы можете оплатить покупки во всехроссийских ресторанах Burger King со счета своей карты Burger Kingс помощью Вашего Android устройства.Вы можете проверить баланс Вашей карты Burger King и посмотретьисторию транзакций.Скачайте приложение, введите в него номер и ПИН-код своей картыBurger King, зарегистрируйте свою карту и приложение сгенерируетштрих-код, который нужно отсканировать для оплаты на кассе.Russian official appBurger King Card Mobile Russia for Android.Now you can use your Android device to make purchases at BurgerKing through augmented in advance at the restaurant (so far only)Card.This is the fastest way to pay Burger King - just scan the barcode!With this application, you can pay for purchases in all Russianrestaurant Burger King from the account of the card Burger Kingwith the help of your Android device.You can check the balance of your card Burger King and see thetransaction history.Download the app, enter his number and PIN of the card Burger King,register your card and the app will generate a bar code to bescanned at the cash register to pay. С помощью мобильного приложения Шоколадница, Вы всегда сможетеначислить, либо списать бонусы при заказе в кофейне;воспользоваться Вашим абонементом на кофе или пополнить его непосещая кофейню; посмотреть историю начисления и списания бонусов(чашек кофе абонемента); зарегистрировать Вашу Шоколадную карту илиабонемент на кофе. Если Вы еще не являетесь участником программылояльности, то с помощью приложения можете получить виртуальнуюбонусную карту или приобрести абонемент на кофе, тем самым вступитьв программу. Также благодаря приложению, пользователи мобильныхустройств теперь легко смогут определить, где находится ближайшаякофейня. Кроме того, Вы всегда будете в курсе действующих акций иновостей от Шоколадницы. Приложение работает в кофейнях Москвы иМосковской области. With Chocolate mobile application, you willalways be able to charge or cancel bonuses when ordering at acoffee shop; use your subscription for a coffee or recharge itwithout visiting a coffee shop; look at the history of charging andcancellation of bonuses (subscription cups of coffee); Chocolateregister your card or ticket for a coffee. If you are not yet amember of the loyalty program, using the application can get avirtual bonus card or buy a ticket for a coffee, thereby start theprogram. Also, thanks to the application, mobile device users cannow easily determine where the nearest coffee shop. In addition,you will always be aware of existing shares and news from Chocolatemachines. The application works in coffee shops in Moscow and theMoscow region. Это приложение создано специально для драгоценных клиентов «ТвойДом». С помощью мобильного приложения «Твой Дом – Драгоценности»,Ваша карта всегда будет с Вами. Если Вы не являетесь участникомпрограммы лояльности, то Вы можете получить виртуальную бонуснуюкарту, тем самым вступить в программу. Благодаря приложению Высможете просматривать бонусный баланс, историю Ваших покупок ипривилегии по Вашей карте. Легко определите, где находитсяближайший магазин и будете в курсе персональных предложений от сетигипермаркетов «Твой Дом». "Your House" is an application createdespecially for the precious customers. With the mobile application"Your Home - Jewels", your card will always be with you. If you arenot a member of the loyalty program, you can get a virtual bonuscard, thereby start the program. Due to the application, you canview the bonus balance and history of your purchases and benefitson your card. Easily determine where the nearest shop and will beaware of the personal suggestions of hypermarkets, "Your House". BK® Tickets es la app de BurgerKingdebeneficios para empleados de empresas.Descargá GRATIS la app y disfrutá los mejores descuentosenBurgerKing Argentina.Tickets BK ® is theappforBurger King employee benefits business.FREE Download the app back and enjoy the best discountsinBurgerKing Argentina. 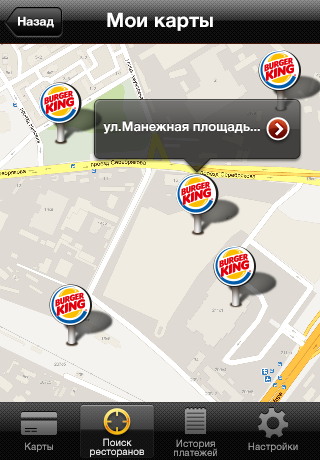 The newest,easiest to use, and fastest Fast Food Finder in theAndroid Market. With a few clicks find a quick bite to eat nearyour current location on the map (or by address andtouch).Restaurants are divided into different cuisines andcurrently restaurants include A&W Restaurants, Arby's, BurgerKing, Carl's Jr./Hardees, Checkers, Culver's, Dairy Queen, FiveGuys, In-And-Out, Jack in the Box, Long John Silver's, McDonald's,Red Robin, Sonic Drive-In, Wendy's, Whataburger, White Castle,Blimpie, Quiznos, Firehouse Subs, and Subway.Chicken placesincluded are Popeye's, KFC or Kentucky Fried Chicken, and Chick FilA.If Mexican is your thing you can use Find Food Fast to locate anearby Chipotle, Del Taco, Baja Fresh, or Taco Bell.If you arelooking for dessert or a coffee pick me up we have got you coveredwith Dairy Queen, Baskin Robbins, Cold Stone Creamery, Friendly's,Caribou Coffee, Peet's Coffee, Tim Hortons, Dunkin' Donuts, orStarbucks.If you are craving pizza find the nearest Pizza Hut,Domino's, or Papa Johns.You can also search based on cuisine aswell if you aren't sure what restaurant you want to find.Once youselect a restaurant the nearest locations will show up on the map.From here you can choose a location and navigation will start oryou can view the menu and nutritional information.New restaurantsare being added all the time and if something is missing, contactus and we will add it! You can get in touch with us via email [email protected] or by any of our social networks accessed bythe Brennasoft menu in the app. (accessed by the menu button, oroverflow button in Honeycomb)UpcomingFeatures*Favorites*Checkins*RatingsRequired Permissions*Location -determine your location*Internet - to retrieve restaurantdata*Access Network State - determine whether on wifi/3g and handlechangesThis is a third party application and is not affiliated withthe mentioned restaurants. En esta aplicación puedes encontrar Ofertas Exclusivas sólodisponibles en el App, Cupones descuento para disfrutar de tusmenús y productos favoritos al mejor precio y todas las promocionesde BURGER KING® para que no se te escape nada. Además podrásencontrar el restaurante más cercano y te ayudaremos a llegar paraque no te pierdas la experiencia de visitarnos, además podrásdisfrutar de nuestro servicio a domicilio. In this application youcan find exclusive offers only available in the App, discountcoupons menus and enjoy your favorite products at the best priceand promotions all BURGER KING® so you do not miss anything. Plusyou'll find the nearest restaurant and help you get to not miss theexperience of visiting, you can also enjoy our delivery service. Get secret deals and exclusive mobile coupons with the officialBURGER KING® app and save like a king! Explore our menu and findyour nearest BK® restaurant anytime, anywhere. And in mostlocations, you can even order ahead. Specific features include: -Mobile Coupons: Get VIP access to the hottest mobile-only couponsand secret deals right from your phone. - Mobile Ordering: Forselect locations, order with the app and skip the line to enjoyyour meal even faster. 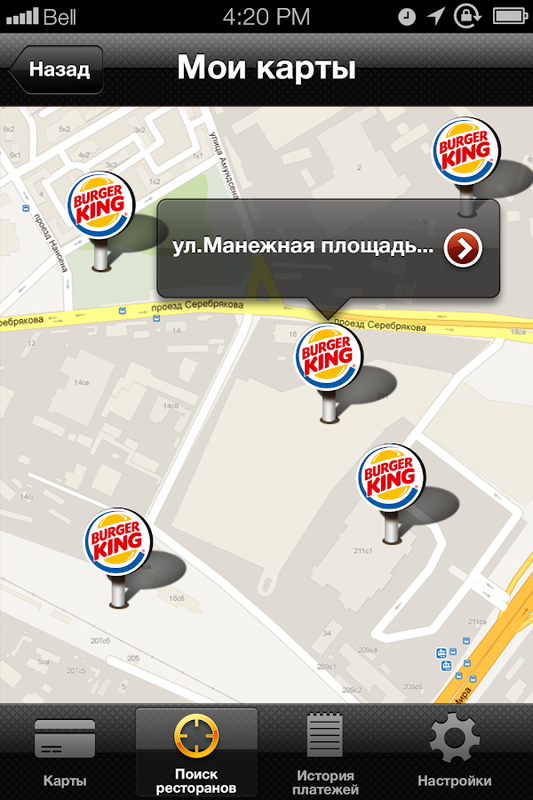 - Find Your BK®: Locate your nearest BURGERKING® restaurant and never leave those flame-grilled cravingsunfulfilled. - Menu: Explore your BK® favorites and discover ourhottest new menu additions. Plus, you can browse item descriptionsand nutritional information at any time. Die offizielle McDonald's Android App: Deine Lieblingsprodukte,alle Restaurants und Coupons. • Aktuelle Aktionsprodukte* und alleunsere Klassiker • Produktinformationen** mit Nährwerten undAllergenen • Restaurantsuche mit Öffnungszeiten, Services unddirektem Einsprung in die Navigation • Coupons*** zum direktenEinlösen im Aktionszeitraum. Einfach an Kasse oder Kiosk einscannenund sparen. • Bestellen und Bezahlen**** Unsere Antworten auf eureFragen: Wozu benötigt die App meinen Standort? Nicht alleMcDonald's Restaurants nehmen an allen Coupon-Aktionen teil. DieApp benötigt deinen Standort, um dir die Coupons anzuzeigen, die duin den Restaurants in deiner Nähe einlösen kannst. Wozu muss ichmich registrieren? Neben deutschlandweiten Aktionen wie demGutscheinheft, gibt es in der App regelmäßig exklusive Coupons.Diese sind nur in der App und nur für registrierte Nutzererhältlich. Um dir Coupons nach deinem Geschmack bieten zu könnenund dich über neue Aktionen auf dem Laufenden zu halten, benötigenwir deine Registrierung. Warum sehe ich trotzdem keine Gutscheine?Solltest du dich ganz neu registriert haben, kann es einige Minutendauern bis du deine Coupons siehst. Bitte hab einen Moment Geduld.Solltest du bereits alle Coupons verputzt haben, schau bald wiedervorbei. Es gibt regelmäßig neue tolle Angebote. * Aktionsproduktegibt es in allen teilnehmenden Restaurants in Deutschland und inLuxemburg. ** Preisinformationen bekommst du direkt im Restaurant. *** Coupons findest du in der App nur zu deutschlandweiten Aktionenund/ oder im Aktionszeitraum. Das Einlösen ist nur in teilnehmendenRestaurants möglich. Die Liste der teilnehmenden Restaurants sowiealle weiteren Einlösebedingungen findest du unter den Coupondetailsin der App. **** Mobiles Bestellen und Bezahlen ist bisher nur ineinzelnen Restaurants verfügbar. Eine Liste der teilnehmendenRestaurants findest du in der App. Mobiles Bezahlen setzt einegültige VISA oder Mastercard Kreditkarte voraus. DieBestellfunktion ist nur aktiv, wenn du dich in der Nähe einesteilnehmenden Restaurants befindest. The official McDonald'sAndroid app: your favorite products, all restaurants and coupons. • Current Promotional Products * and all our classics •Product information ** with nutritional information and allergens •Restaurant search with opening times, services and direct access tothe navigation • Coupons *** for direct redemption during thepromotion period. Simply scan at checkout or kiosk and save. •Order and pay**** Our answers to your questions: Why doesthe app need my location? Not all McDonald's restaurantsparticipate in all coupon promotions. The app needs your locationto show you the coupons you can redeem at restaurants near you. Whydo I have to register? In addition to nationwide promotions such asthe coupon booklet, there are regularly in the app exclusivecoupons. These are only available in the app and only forregistered users. In order to be able to offer coupons to yourliking and keep you up to date on new promotions, we need yourregistration. Why do not I still see coupons? If you havere-registered, it may take a few minutes to see your coupons.Please be patient for a moment. If you have already plastered allcoupons, check back soon. There are regularly new great offers. * Promotional products are available in all participatingrestaurants in Germany and in Luxembourg. ** You get priceinformation directly in the restaurant. *** Coupons can be found inthe app only for Germany-wide promotions and / or in thepromotional period. The redemption is only possible inparticipating restaurants. You can find the list of participatingrestaurants as well as all other redeeming conditions under thecoupon details in the app. **** Mobile order and payment iscurrently only available in individual restaurants. A list ofparticipating restaurants can be found in the app. Mobile paymentrequires a valid VISA or Mastercard credit card. Ordering is onlyactive if you are near a participating restaurant. Con l’app ufficiale di Burger King Italia le promozioni, i coupon,i ristoranti più vicini a te e le novità di prodotto sono sempre aportata di mano. Scaricala ora per usufruire delle offerte e deicoupon esclusivamente dedicati ai possessori dell’APP!! "L'usoprolungato del GPS in background può ridurre drasticamente ladurata della batteria." With the official app of Burger King Italypromotions, coupons, the closest restaurants to you and the newproducts are always at hand. Download it now to take advantage ofoffers and coupons exclusively dedicated to the JPA's owners !! "Continued use of GPS running in the background can dramaticallydecrease battery life." Des burgers aussi bons que généreux, une viande grillée à laflamme… et ces frites ! Calmez-vous, il s’agit seulement del’application BURGER KING® France à télécharger. Dans l’applicationBurger King®, venez saliver devant vos menus et burgers préférés.Que vous soyez un adepte de bacon, de fromage, de bœuf ou depoulet, consultez l’intégralité de notre carte. Retrouvez nosrecettes emblématiques : du WHOPPER®, au STEAKHOUSE, enpassant par le BIG KING® ou le LONG CHICKEN®. Découvrez lacomposition des menus et choisissez parmi la sélection de nossnacks et desserts incontournables. Après il ne suffit pas decoller son nez à l’appli pour sentir l’odeur du steak grillé à laflamme… C’est pourquoi, on vous propose de retrouver l’adresse devotre restaurant BURGER KING® le plus proche pour venir passercommande sur place ou à emporter, au drive ou à pieds, Enfin, onvous tient informé de toute l’actualité BK, des nouveautés et desbons plans à ne pas manquer. Qui nous aime, nous suive !https://www.facebook.com/burgerkingfranceofficiel/https://www.instagram.com/burgerkingfr/ https://www.burgerking.fr/https://twitter.com/BurgerKingFRhttps://www.youtube.com/channel/UCOUYCp_k1mHGwXAz3uRpjyw Hmmm…BURGER KING® ! Discover the official app for BURGER KING® Puerto Rico.Everythingyou need for BURGER KING® lovers.. Restaurant Finder- Find theclosest BK®.- Detailed information by restaurant.- Map your closestrestaurant visit Digital Coupons- Exclusive Offers. Promotions-Find out about current promotions. Products- Information about ourmenu. Country Selection- Same app, different countries. 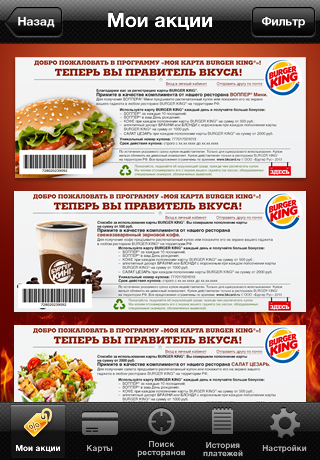 Changeeasily between countries and stay informed about BURGER KING® newsand coupons, even when you are out of the country (if the countryis available).The application uses analytics technology. You candeactivate this information via your general setting on the BURGERKING® app and disable “use analytics technology”.